I’ve been on hiatus for about a month or so now, my apologies to all! I had a nearly-month-long trip to visit the US. My husband, son and I visited family in NY and CO and it was lots of fun, albeit not very refreshing travelling with a one-year-old. However, the big news is…drum roll please… I met up with my loverley agent, Alison McDonald from The Rights Factory! Yep, I’m signed and I am super excited about it!! It’s so fun having someone to work with on my manuscripts. If you want to contact her regarding my work, she is available via their website, http://www.therightsfactory.com/. 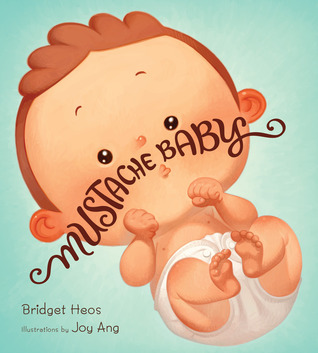 Now, back to the topic at hand: MUSTACHE BABY (Written by Bridget Heos and Illustrated by Joy Ang). When I came across this book I practically ripped it off the shelf in my enthusiasm. What an absurd and endearing concept. I tend to gravitate to (and write) quirky and absurd stories so this is right up my ally. The story is about a newborn baby who, fresh out of the womb, is already sporting a mustache. But the questions remains: is this a good-guy mustache or a bad-guy mustache? First thing’s first: you won’t find a concept like this anywhere else. If this story tickles your fancy, then you might as well grab this book ‘cuz baby, there’s no other Mustache Children lurking around the shelves of bookstores. Actually, Mustache Children sounds particularly creepy. There’s not much didactic about this story either, which I appreciate. It’s just some odd fun. The story explores the stereotypes and clichés surrounding different types of mustaches. It’s a story for the sake of the story, which is often the best kind of story. Did I mention this was a story?! That being said, I am more partial to a stronger narrative arc. This is just a personal preference of course, and this one is definitely worth a look if you are a lover of the quirky and strange. Ang’s illustrations happily embrace the absurdity of it all, whilst clearly conveying the stereotypes and cliches to children who might not really understand mustache cliches yet (there’s a term I never thought I’d use; ‘mustache cliches’). I’d say this would be suited to children in Kindergarten and Year One.